Figure Skating - ISU Grand Prix Rostelecom Cup 2017 - Men's Free Skating - Moscow, Russia - October 21, 2017 - Nathan Chen of the U.S. competes. MOSCOW - Nathan Chen of the United States won the first grand prix event of the season in Moscow on Saturday, defeating Japanese rival Yuzuru Hanyu by just over three points. The 18-year-old American doubled a triple lutz and did not stick to his announced free program but still managed to score 193.25 points to win the event with an overall score of 293.79 points. Chen said he was pleased with his quads in the first half of his free program but admitted fatigue had caught up to him and triggered mistakes. “But this is my first grand prix win and I‘m excited for the rest of the season,” Chen said. Moscow’s grand prix event is the first of six to qualify for the Grand Prix Final in Japan in December, which comes two months before the start of the Winter Olympics in Pyeongchang. Hanyu, the Olympic champion, landed three quads but missed a combination jump, tripled a quad loop and doubled a quad toeloop to earn 195.92 points in the free program. “I‘m a little bit satisfied with my performance,” Hanyu said. Hanyu had finished second behind Chen in the short program on Friday, earning 94.85 points after making a shaky landing on the quad loop jump at the start of his performance. Chen was nearly six points ahead of Hanyu in the short program, recording 100.54 points in a performance that included a dazzling quad lutz and triple toe loop combination. Russia’s Mikhail Kolyada finished third in the grand prix event with a total score of 271.06 points. 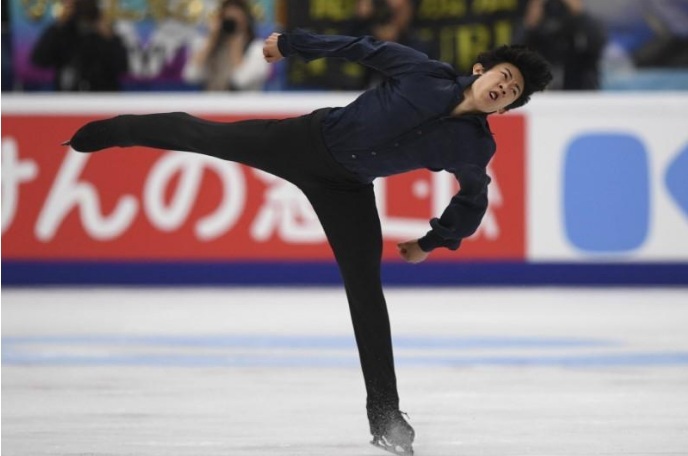 Nathan Chen of the United States won the first grand prix event of the season in Moscow on Saturday, defeating Japanese rival Yuzuru Hanyu by just over three points. The 18-year-old American doubled a triple lutz and did not stick to his announced free program but still managed to score 193.25 points to win the event with an overall score of 293.79 points.